Surf. Raft. Hike. Kayak. Zipline. This is a very well designed trip, adventurous and action-packed, but with the right amount of downtime to reflect and relax. 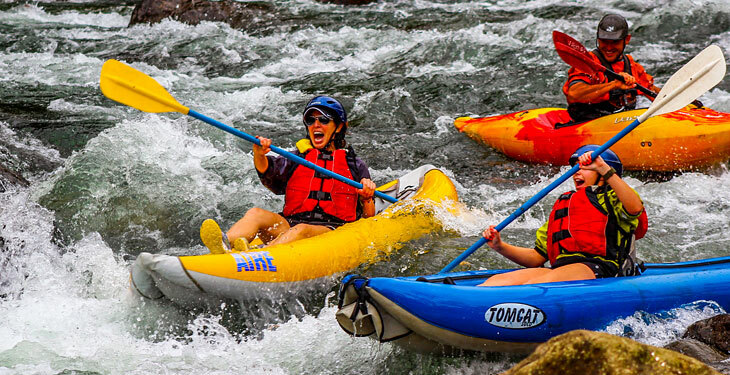 If you crave excitement and dynamic exploration, this 8-day adventure with Costa Rica Rios is the trip for you! Explore the real Costa Rica, traveling to a full range of the country’s extreme natural landscapes. Witness tropical birds and sloths while whitewater rafting the Pacuare River to your jungle lodge. You'll get first-hand experience of the rainforest’s awe-inspiring natural beauty on a zip-line tour through the canopy. Grab a mountain bike and explore the lush cloud forest and volcanic landscapes around Irazú and Turrialba, or join a canyoneering tour and learn to rappel yourself down sparkling jungle waterfalls. Once you've got your blood pumping, head to the coast to soak up some vitamin D while surfing or snorkeling in the clear blue waters and coral reefs of Cahuita National Park. Each day offers a new exhilarating adventure that reconnects with nature and lets you indulge in some quality rest and relaxation time in your hammock. In the evenings you're free to rest or blow off some steam at a beachside Caribbean reggae club where you can dance the night away. Gear up for eight days of exploring and thrill-seeking that will leave you feeling invigorated and truly human-powered. A Costa Rica Rios guide will greet you at the Juan Santamaria International airport in San Jose, Costa Rica (SJO) upon arrival. Take a two-hour drive through orchards, small towns, and beautiful coffee fields before arriving at your hotel in Turrialba — which features comfortable accommodations with a tropical courtyard, volcano views, and a relaxing hammock area. Enjoy a delicious and authentic Costa Rican meal, practice your Spanish, and get to know the guide and your fellow adventurers. After a filling breakfast and local Turrialba coffee, get outfitted with river gear and prepare for your first day on the water. No prior kayaking experience is required. Using a unique practice site on a local river, you'll become familiar with the kayak and raft equipment, basic strokes, and maneuvers. After some paddling instruction, jump in the Rio Pejibaye, a gentle class II/III river, making it perfect for learning. Most of the group will be outfitted with inflatable kayaks. More proficient kayakers may choose to use hardshell kayaks, while others may help paddle an inflatable raft. Practice moving-water maneuvering skills while keeping your eyes open for glimpses of Costa Rica's many beautiful birds and butterflies. After enjoying another great breakfast, get outfitted for an awesome three-day and two-night rafting trip on the world famous Lower Pacuare River. Enjoy eight miles of challenging whitewater, with riverside stops to hike up to secluded pools below tributary waterfalls. Throughout the river trip there will be many opportunities for swimming or relaxing next to the river. Arrive at the Pacuare Eco Lodge, which is equipped with a full kitchen, showers, bathrooms, fully enclosed cabanas, and the best vantage point of the beautiful river and jungle. Settle in and spend time practicing kayak skills, swimming, exploring the jungle, or just sitting back in a hammock and relaxing. Enjoy a dinner prepared by your guides, consisting of Costa Rican rice and beans, tropical fruit, vegetables, and chicken. Rise from your jungle lodging and enjoy a wonderful start to the day along the Pacuare River, observing and listening to the many species of birds. 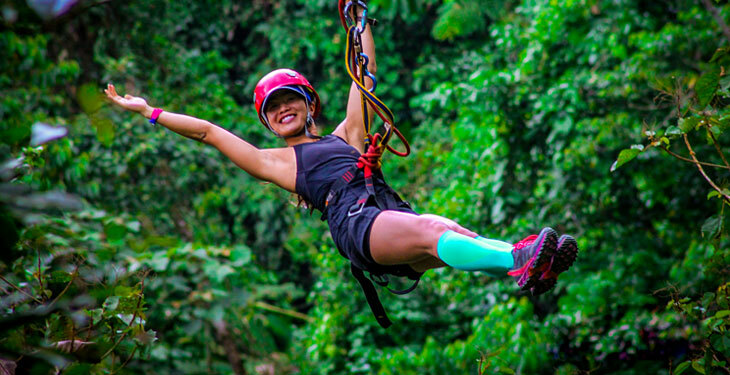 After breakfast, your guides will prepare you to experience an adrenaline packed day in a rainforest canopy tour that Tarzan would be jealous of. 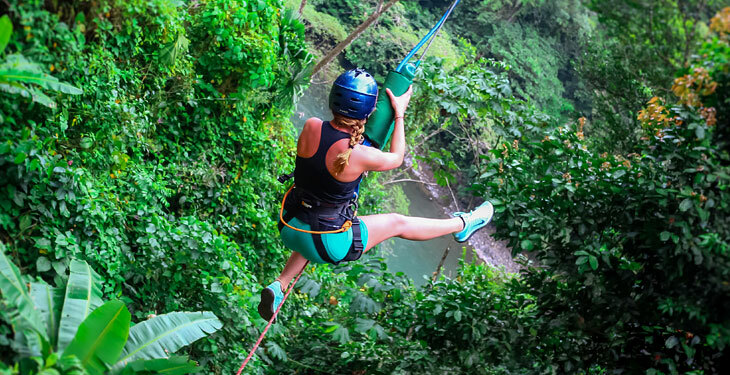 The group will harness up to experience the excitement of crossing the jungle canopy on zip-lines, rappel down trees, and walk above the jungle floor on a suspension bridge. The afternoon is yours to rest and relax in hammocks, spot birds and wildlife, swim in waterfalls, or hike in the rainforest near the Pacuare Eco Lodge. Early risers can enjoy a morning hike through the dense rainforest surrounding the lodge. The rafting trip continues down the most challenging section of the Pacuare as class IV drops seem to be around every corner. The spectacular river canyon and virgin rainforest create vertical walls of green, broken by waterfalls and hanging vines. Continue the journey to the Caribbean Coast and enjoy a relaxing evening stroll along the beach, shop for some souvenirs, and indulge in a delicious dinner and perhaps a beachside Caribbean dance club before calling it a night. The white sand beach and clear blue ocean give you many choices today. Take an early morning walk along the beach and through the tropical jungle to spot howler monkeys, sloths, and birds. After breakfast, you'll get a surfing lesson from one of your guides using soft top long boards and boogie boards. Take a break and enjoy a delicious lunch in a small local restaurant before visiting Cahuita National Park. After lunch, head out on a boat for some snorkeling. Tropical fish and coastal reefs await any snorkelers in the group, or you can hike along the beach spotting wildlife in the jungle. Pack up and begin your journey through the flat Caribbean terrain, and up through the eastern slopes of the central mountains to Turrialba to spend the night back at the hotel. For today’s mountain biking adventure, you'll select a bike in the bodega and the guides will adjust the K2 ZED 4.0 bikes to provide optimum comfort and performance for a journey down Volcan Irazú and through the cloud forest. The summit of Irazú is at 11,259 feet and offers spectacular views of the region and the volcano caldera. Prepare for an unforgettable mountain biking experience as you descend 9,200 feet to the town of Turrialba. The route takes guests through Turrialba National Park's lush cloud forest to the shoulder of the Turrialba Volcano and passes through small villages and hillsides laden with ferns and bromeliads. Have lunch in a valley between the Irazú and Turrialba volcanoes with a grand view of the surrounding peaks. After some time to rest, continue down into the valley and cruise back to the bed and breakfast in time for a shower and filling dinner. 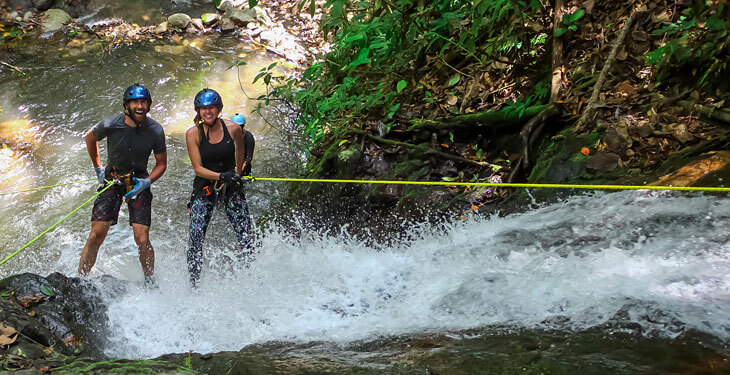 If canyoneering is more appealing than mountain biking, you have the option to enjoy a full day canyoneering tour in a private reserve right in the heart of the rainforest. A local naturalist guide will lead the group along the trails to the canyons. From there it is a fun rock-scrambling, waterfall-rappelling day in a “leave no trace” environment. At each waterfall the guides will prepare the ropes as there are no permanent fixtures. 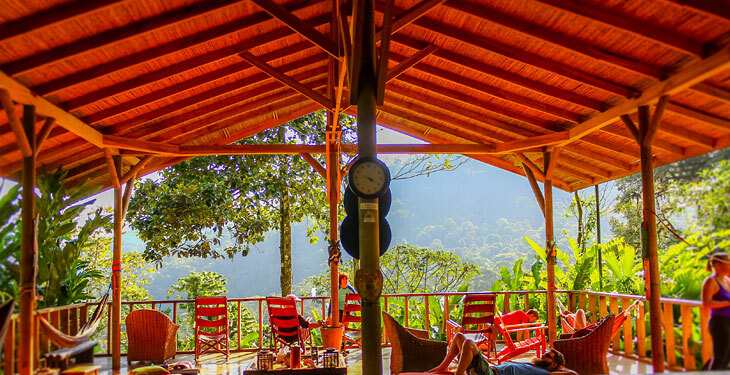 Enjoy a delicious lunch, cooked up over a wood stove, with spectacular views down to the Turrialba Valley. Enjoy a great breakfast sharing your experiences. Say your goodbyes at the airport and start making plans for your next trip to Costa Rica! World-class guides, great equipment, and high-adrenaline activities make for a safe, jam-packed, and action-filled week. 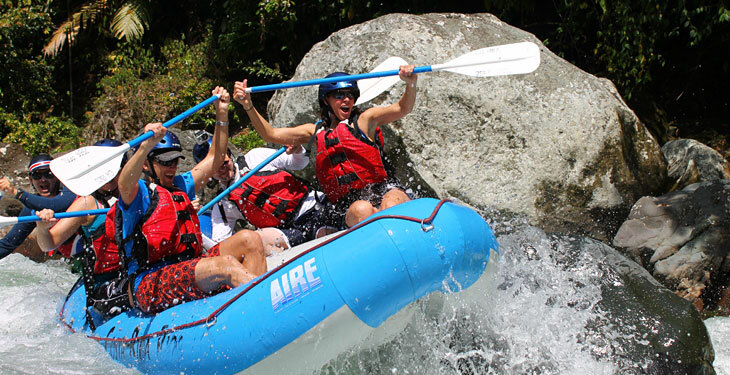 Established in 1995 by Jane and Fraser Tyrrell, Costa Rica Rios is a family-run, multi-sport adventure based company that provides unforgettable tours of Costa Rica. Specializing in displaying the best of this beautiful country’s whitewater, rainforest, and jungle, Costa Rica Rios continuously strives for higher quality tours by constantly improving their itineraries to surpass all clients’ expectations. Employees strive to maximize guests' sense of adventure, awe of nature, and expectation of professional service. With Costa Rica Rios, you're guaranteed to be amazed by the natural wonders and excitement of Costa Rica. 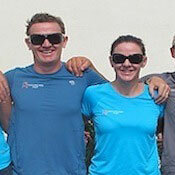 I have used many adventure companies over the years. I have used various guides in Nepal, New Zealand, Ecuador, Patagonia, China/Tibet, Iceland, and Africa. I think Costa Rica Rios is near the top of the list. Costa Rica is a beautiful country with lots of great adventure activities to be enjoyed. The guides are world class, the food is great, and Turialba is a wonderful town to use as a base of operations. I recommend Costa Rica Rios without reservation. We had a life changing time and fell in love with Costa Rica. Every encounter and activity that we had exceeded any hopes that we had for the trip. Costa Rica is truly a magical place and we will absolutely return again and hope to use your services. Thank you, thank you, thank you! Costa Rica Rios offers a genuine travel experience you won't find with the standard tours. They'll take you to parts of the country and connect you with the people so you come away with something truly meaningful. I was there as a paddler and the guides are absolutely top notch in every way. This is an outstanding company with people who care. There is a minimum of four participants required per departure date. Please wait to make travel arrangements until you have received confirmation from Costa Rica Rios. High season surcharges apply on select dates (see FAQ). Please note there is a minimum of four participants required per departure date. Do not make any travel arrangements until you have received confirmation from Costa Rica Rios. Is there a high season surcharge? There is a $200 surcharge for Peak Season departures over Christmas (December 21-28th), New Years (December 28-January 4th), and Easter (April 4th-11th) that is payable directly to Costa Rica Rios at the time of booking. If interested, please email us for arrangements. The closest airport is Juan Santamaria International in San Jose (SJO), which is a scenic 2-hour drive from the Turrialba bed and breakfast. Your Costa Rica Rios guide will greet you at the Juan Santamaria International airport in San Jose, Costa Rica upon your arrival. What forms of currency are accepted in the area? Although the colón is the official currency of Costa Rica, US dollars are widely accepted and often preferred. Credit cards are widely accepted and ATMs are available in Puerto Viejo. Tucked in the mountain valley town of Turrialba, Villa Florencia is a comfortable boutique hotel set amidst sugarcane fields and lush vegetation. The ambiance of Villa Florencia is quiet, peaceful and discreet. It is an excellent choice for families and couples seeking the solace of a retreat in a natural setting. The hotel facilities include an amazing outdoor pool, spa tub, and a home-style restaurant serving local cuisine. The Pacuare Eco Lodge is a jungle adventure camp located in the heart of the rainforest overlooking the Pacuare River. The lodge consists of seven open-air cabins, which can sleep from three to six people with flexible sleeping configurations according to guest preferences. All have spectacular views of the jungle and Pacuare River valley. Lodge guests can enjoy high-intensity outdoor jungle activities that include a Tarzan swing, waterfall jumping, rafting, whitewater tubing, zip-lining and a hike to nearby Tsiobata, which is home to the Cabecar Indigenous Tribe. Solo travelers must pay a single supplement fee of $300 to reserve their own room. You may also choose to opt out of this fee and be paired in a room with another traveler of the same gender, if this option is available. In general, you'll be comfortable in shorts and a t-shirt during the daytime, and long pants and a shirt in the evenings. Avoid cotton clothing as it tends to get cold when wet and takes longer to dry. At higher elevations, a sweater or jacket is needed. Because rain showers may occur any time of year, you may wish to bring something to wear in the rain. Pack a pair of walking shorts, a couple of quick dry t-shirts, comfortable walking/hiking shoes, socks, underwear, bandana, billed or brimmed hat, rain jacket and pants, lightweight polypro sweater or jacket, lightweight long pants and shirt. Also pack a towel for the beach, extra batteries, camera, film, insect repellent, sunscreen, sunglasses and retention strap, and personal toiletries. Bring along a good-sized daypack. If you’d like a detailed packing list prior to booking, please contact Costa Rica Rios. Costa Rica enjoys a very consistent tropical climate year round, so it's always a great time to visit. The average daytime temperature in Turrialba is 82° F and along the coast the temperature varies from 70 into the 90’s. During the dry season (December through April), sunny blue skies and warm, dry days are normal. Throughout the rainy or green season (May through November), the typical pattern is sunny and hot in the morning with a pleasant rain shower in the late afternoon. What kind of shape do I need to be in for this trip? Are any special outdoor skills required? All trip activities are suitable for anyone in average physical shape, and no experience is necessary. You'll get even more enjoyment out of the trip if you have some experience mountain biking over uneven terrain, and regular exercise prior to the trip will make the more challenging days a lot easier. Yes, all meals are included. Costa Rican fare is fresh and delicious. Meals are prepared fresh daily, by Costa Rica Rios’ own personal chef, with locally grown fruits and vegetables and fresh meats, fish, and cheese. A typical Costa Rican diet consists of rice, black beans, cheese, chicken, beef, fish, salads, vegetables, and of course fresh tropical fruit. Costa Rica Rios attempts to have a delicious regional or international dish for every meal, plus great desserts. If your diet requires a special food selection, please notify Costa Rica Rios at time of booking. Costa Rica Rios recommends bringing $250 per person to cover gratuities, alcoholic beverages, and souvenirs. Most shops in Costa Rica accept credit cards for alcohol and souvenirs, but only cash is accepted for gratuities. Please note there is also a photo package available for guests to purchase at the end of the week, should they choose. Cash is the only accepted payment method for the photo package. Book confidently with Free Cancellations within 72 hours of booking. After 72 hours, cancellation fees will apply. Cancellations are subject to the full discretion of Costa Rica Rios. For more information on our Travel Cancellation Policy please Click Here.